Best Grain Free Dog Food - A Gluten-Free Diet For Your Dog! ​Many dog owners opt for grain free dog foods as gluten-packed foods can be dangerous and harmful for dogs. These gluten-packed foods are potential allergens. As such, many owners opt to create a hypoallergenic diet for their dogs in order to keep them away from harmful reactions. However, gluten is not the only component that can act as potential allergens. Chicken meat and beef meat can also be considered as potential allergens, and they can pretty much be found in all sorts of dog food. As such, I have compiled a list of best grain free dog food which also features chicken-free and beef-free variants so you are ensured that your dog won’t suffer from any potential allergens. Read away to find out! Coming up as the first contender for best grain free dog food is this product from Taste of the Wild. Probably the main reason why you’re buying grain-free dog food is to prevent allergic reactions in dogs, and Taste of the Wild gets you. What I love the most about this product is that it completely caters to the needs of an allergic dog. The protein that is in this product does not come from common meat sources which can trigger allergic reactions to dogs. In addition to this, this product is only loaded with protein from wild animals such as bisons, boars, lambs, salmons, etc. If you’re wondering why beef and chicken aren’t components of this product, well, this is because their meat can trigger allergic reactions as much as gluten-packed food. As such, if you haven’t hinted already, if you’re going for a grain-free dog food, always go for unusual protein sources. Aside from that, this product gives the necessary amount of nutrients -- high in protein, balanced in fats, and light in carbs. In addition, this product is also infused with a great amount of antioxidants and anti-inflammatory components as well as the essential fatty acids. It also comes with good bacteria in order to aid your dog’s digestion. This grain free dry dog food from Merrick is a great product that offers high amounts of hypoallergenic-sensitive protein. It lacks gluten so this is a great product again for your dog with a sensitive diet. This product’s protein is sourced from wild animals such as buffalos, rabbits, salmons, and the likes. Though it comes with beef and chicken flavors, you can always choose to not get them so you are assured that your dog won’t have any allergic reaction to the food. That is the primary reason for buying a grain free dog food, after all. Aside from that, this product also comes with components such as omega 3 and omega 6 in order to aid the immune system in its anti-inflammatory and antioxidant capabilities. This product also comes with 4 types of good bacteria in order to again aid in the digestive capacity of your dog. Sourced from wild animals such as buffalos, rabbits, salmons, etc. 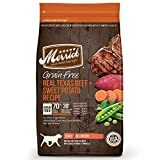 Merrick Grain Free Real Texas Beef & Sweet Potato Dry Dog Food, 4 Lbs. This product by AvoDerm is a great grain free dog food if your dog is suffering from kidney problems. Among all the other contenders in this list, it has a raw protein percentage at 23%. This product also has less fat while being infused with more vitamins and minerals. These beneficial nutrients are sourced from healthy but non-allergenic fruits and vegetables such as avocados and potatoes. This product comes in different variants such as chicken, beef, salmon, etc. You may have noticed that this product comes in chicken and beef variants which are earlier discussed as potential allergenics. As such, I suggest you don’t go for these variants. I personally prefer going for the Salmon, Lamb, and Rice variants as they contain more nutritious and non-allergenic grains like oats and rice. These variants naturally contain high amounts of amino acids which are indispensable for the growth and repair of your dog’s tissues. What differs this product from all others is that this product has avocado. Actually, AvoDerm puts avocado in all its products. Many people believe that Avocado is one of the healthiest foods for humans, but dogs are no exception to this. Avocados can greatly increase the overall being of your dog as they generally bring a huge amount of benefits. This product from BLUE Wilderness is a great contender for the best grain free dog food, and it’s worth taking the time to know why. Each bit of this product is loaded with just the right amount of minerals and vitamins to make sure your dog can attain proper oxidative balance. This product comes in many variants such as chicken, salmon, and duck, but I personally suggest you go for the salmon or duck variants to ensure that your dog is free from any potential allergens. If you’re wondering why, as previously mentioned, chicken meat has components which can be potential allergens to your dogs. As such, you can fully maximize this product’s gluten-free component. The protein levels of this product are also great for your dog. This product also contains glucosamine which is a great help if your dog’s joints are suffering from any issues. This product also contains important nutrients such as calcium and phosphorus in order to effectively and naturally help in maintaining and bettering your dog’s bones. If that’s not enough, this product also has necessary fatty acids for your dog’s better health. 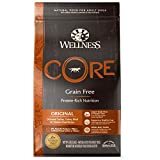 This product from Wellness Core is a great choice as it includes chondroitin and glucosamine as one of its components. If you haven’t known already, these two substances are great for your dog’s joints and pretty much reduce the risk of arthritis and related diseases. It can be pretty much said that in this list, you should go for this if your dog is suffering from any joint-related issues. Aside from that, this product comes with 4 types of bacteria to further help your dog in his/her digestion. Not only that, essential fatty acids infused in this product also help in reinforcing your dog’s immune system. While this product doesn’t have any grains that may be allergens to your dog, this product packs a lot of carbohydrates to ensure your dog always has the energy for all sorts of activities everyday. The only downside I believe on this product is that chicken is included as one of its components. We have previously discussed that we’re trying to avoid chicken and beef components as much as possible as they have pretty much the same allergenic potential as grains that we’re trying to avoid. Good news though is that this product comes in a turkey & chicken variant, wherein the turkey can lower the allergenic capability of chicken. All of their proteins are sourced from wild animals so you can pretty much assure that your dog won’t have any allergic reaction to them. Now that we’ve discussed the great contenders for the best grain free dog food, let us now delve into what we should consider in choosing the best grain free dog food. While all of them looks similar, it comes without saying that you should only go for the best, even with just small margins of better aspects. As such, I have put exactly the factors that we should consider when choosing the best grain free dog food. Read away! One of the most important factors that we should consider is the protein quality of the product. While it’s true that dogs should get plenty of protein, it’s also important to note that the protein source is of remarkable quality. Since dogs are canine, protein sourced from animals are better digested by their cells. As such, it’s best if the protein source of the product comes off from animal sources. Another thing to note is that it’s best if the animal source is sourced from novel and wild sources. Wild animals such as boars, rabbits, lambs, ducks, etc. are great for your dog as you can pretty much ensure that they won’t have any allergenic effects on your dog. I may have forgot to tell you but not all grains are actually harmful for your dogs. As a matter of fact, wholesome grains are great for your dogs as they are often included amino acids and other nutrients to boost your pet’s system. Look for grain sources such as brown rice and quinoa as they are great for your dog. It comes without saying that the ingredients of the product should only be sourced from natural sources. We don’t want any artificial chemicals lingering in our food’s pet no matter how much they claim they can help the dog as they can bring more harm than good. It’s best if we stay safe and steer away from chemical-infused products. 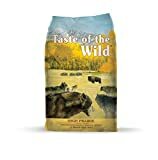 Now that we’ve tackled the things that we should consider in choosing the best grain free dog food, the winner now comes as Taste of the Wild Grain Free High Protein Natural Dry Dog Food! There’s a good amount of reasons why, and let’s now discuss. First of all, this is pretty much the best option if you’re looking for a totally hypoallergenic diet for your dog. Every protein from this product is sourced from wild animals, which does not have allergenic potential compared to chicken and beef sources. Some more of its great features is that it’s really high in protein which helps your dog maintain muscle balance. It has an adequate amount of fats so you’re sure that your dog won’t get cold easily, and a lot more of its benefits without going over the line. It also gives a decent amount of carbs that is enough for your dog to stay active. Aside from that, it gives a great amount of antioxidants and anti-inflammatory components to aid your maintain digestive system. It also comes with probiotics to aid your dog’s digestion.